The Bronx is where George Washington’s forces fought for liberty and hip hop music was born. New York City’s borough of the Bronx draws millions of people annually to visit the largest zoological park in the United States, or catch a baseball game at Yankee Stadium. Beyond the animal cages (and batting cages) is a section of the city filled with art, food, music, and unusual sites that can only be found in one place: Da Bronx. The Bronx is one of the most amazing experiences for visitors to New York City because it is so unexplored. You can take a canoe and course down a river, or take a course in pole dancing school. The Bronx has a rich history going back to the American Revolution that has given way to today’s rebels in street fashion. In 111 Places in the Bronx That You Must Not Miss, sit down and feast on dishes from Ghana and Italy. Learn to roll cigars, pay homage to the founders of rap music and hip hop culture, and explore quiet cemeteries stunning architecture. The borough is home the largest park in New York City, waterfront vistas that are unparalleled, and access to riverfronts and bays. Whether you are a first time visitor or a longtime resident, you will find 111 hidden gems in the Bronx. 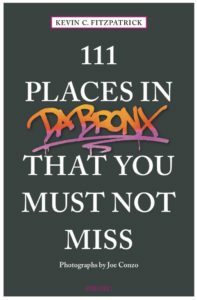 The most unexplored borough of New York City is yours to discover with 111 Places in The Bronx That You Must Not Miss.